With increased dependence of customers purchasing products, goods, and services online, social media is one area which should be targeted by all businesses. Whether you believe or need Social media, it is one vertical that is pinnacle for branding. If you don’t have a Social Media Campaign or presence your competitors are standing out. Or even worse your looking out dated. 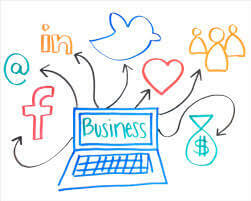 Social Media isn’t just used as a way of staying modern; it can also drive business, generate leads, and allow you to engage with your consumer base. It is an additional advertising platform that can help you boost your ROI. Don’t post false information or incorrect facts. After all there are millions of people exposed to the web and they can instantly catch you for anything deceitful or flattery published online. This kind of an act can also shake the loyalty of your existing customers which can ruin your efforts to build a positive market reputation. So even if you’ve outsourced your content writing work to an external body, do cross check the drafts before putting it live on the web. As you are already aware social platform is all about interactions and engagements, however you should ensure that you are abiding by the norms of each of the social channels you’ve chosen. For example: – a post written for Facebook is different from that of LinkedIn or tweets drafted for your Twitter page. The latter restricts you to stay within the boundaries of 140 characters, so the message is crisp and short. On the contrary, you can add a tinge of style and creativity in the posts you draft for Facebook. Real-time applications like: – online gaming, video conferences, online chatting, electronic transactions, etc. are some of the commonly yet effective ways to enhance your brand awareness and increase user engagement. For example: – if you run a web portal that sells organic or nutritious food of different brands, you can integrate online chatting application wherein customers can discuss specific issues with the nutritionist you’ve hired. Right from expecting mothers, to feeding ladies, to several health conscious people, you can target a large audience and attract them to buy products from your e-store. Last but the not least is to use your imagination and creativity to come up with extraordinary ideas and tricks to grab the attention of your audience and escalate your sales.